Japanese honeysuckle is a well-known plant, found throughout many parts of the United States. 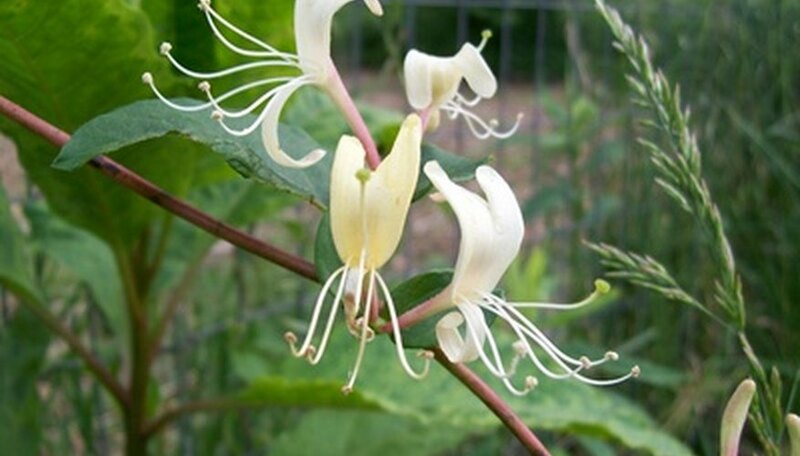 Best recognized by its sweetly scented white or yellow flowers, this type of honeysuckle is an aggressive invasive plant which quickly chokes out any competition. For home gardens, native honeysuckles are a showier and friendlier option which not only attract bees and hummingbirds but also stay where they’re planted. The U.S. Department of Agriculture defines an invasive plant as any “introduced species that can thrive in areas beyond their natural range of dispersal” and which are also typically “adaptable, aggressive, and have a high reproductive capacity.” In short, invasive plants can quickly overrun the area where they’re introduced, crowding out native species upon which many other animals rely, including insects, birds, rodents, mammals and fish. Brought to the United States from Asia in 1806, Japanese honeysuckle (Lonicera japonica) was originally valued as a landscaping plant for its rapid growth as well as its attractive and fragrant flowers. Now included on the U.S. government’s short list of invasive plants, Japanese honeysuckle is regarded as invasive for its tendency to girdle young trees and aggressively shade out other plants by forming dense mats in tree canopies. Individual vines can grow to over 80 feet in length, and in warmer climates may remain somewhat evergreen through the winter. Shrub or bush honeysuckles (Lonicera maackii) are honeysuckle species which occur as understory plants in forested areas. With their dense, twiggy growth, bush honeysuckles quickly crowd out other low-growing forest plants which cannot compete with the dense shade created by a fully leafed-out bush honeysuckle. While the shrubs may make good hiding places for birds, few animals eat the bright red berries which appear in early fall. Coral trumpet honeysuckle (Lonicera sempervirens) is an evergreen to semievergreen native vine which differs from Japanese honeysuckle through its flowers and growth habit. The flowers, which are coral pink or orange, appear in late spring and last throughout the summer. Leaves are typically a dark green with a blue tint, and the vines are woodier than invasive species. Several different cultivars have been developed from the native species, including ‘John Clayton,’ a yellow-flowered form, and ‘Blanche Sandman,’ a deep orange variety. Though the flowers are not fragrant, coral honeysuckle is a particular favorite of ruby-throated hummingbirds. Because the bright pink flowers appear in clusters against the dark bluish-green leaves, native honeysuckle produces a striking visual effect in the home garden. Flowers also persist throughout the summer, whereas non-native honeysuckle flowers fade after flowering in mid-spring. Gardeners in southern climates can expect the vine to remain green throughout the winter, though the vine is deciduous in northern areas. When fruits appear in the fall, they are a favorite food of the purple finch, goldfinch, hermit thrush and ubiquitous American robin.